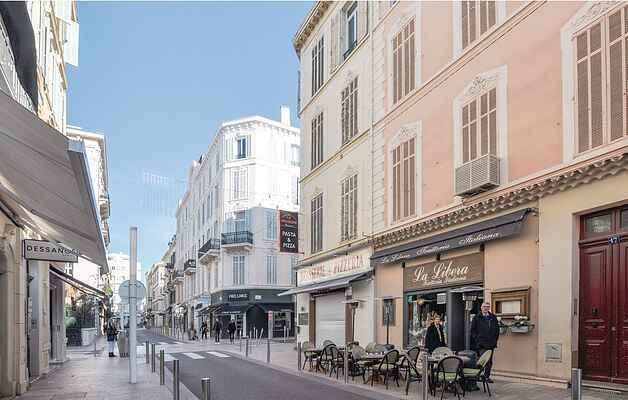 This one bedroom apartment benefits from a fantastic location, just a few metres from the Boulevard de la Croisette and 400 meters from the renowned Palais des Festivals. It is situated on the third floor and overlooks the quiet courtyard below. The holiday home is air-conditioned and boasts an open-plan kitchen and living area, a bedroom and a bathroom. Just 600 metres away is the Boulevard de la Croisette which leads to the old town of Le Suquet. You may also wish to visit the Lérins Islands and discover enchanting spots such as Sainte-Marguerite and Saint-Honorat. For a touch of glamour, head to Saint Tropez or Monaco, which are within easy reach from the holiday home.